DNS is a common term in the world of Internet. Those who are networking geeks will tell you it the reason Internet exists around the world. DNS stands for Domain Name System, in short for server. It allows your computer to be connected to the Internet. Your ISP or Internet Service Provider automatically allocates the primary as well as the secondary DNS server on your desktop. The DNS server can interpret the hostname of the computer into the IP address. At times, when the traffic increases, the server tends to slow down. Thus, affecting the speed of your Internet. To correct this problem, you can turn to free public DNS servers who can handle any amount of traffic due to certain modifications. Let us have a look at the top 5 free DNS servers available in India. Changing your ISP DNS to another provider can make a world of difference in the Internet speed. You can use a DNS server from the many free, public servers available. Many DNS servers also provide you with features such as filtering phishing attempts, blocking adult websites, etc. The best of them all, Google DNS has load-balancing, redundancy and DNS servers set up all around the globe. They also provide security measures like IPv6 DNS servers as well as DNSSEC. The IP address for Google free Public DNS server is 8.8.4.4 and 8.8.8.8. 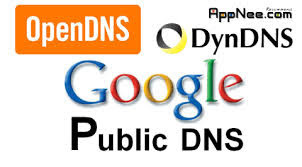 Choose Google Public DNS for faster and secure Internet browsing experience. The next best free DNS server that will provide you with a secure browsing experience is OpenDNS. It carries out malware filtering and helps you protect your family from websites you do not approve of. All you need to do is configure the settings as per your needs. You need to pay for advanced features that gives you customized protection. The IP addresses for OpneDNS is 208.67.222.222 and 208.67.220.220. Another free public DNS server that provides impressive services is DNS advantage. It provides high security as well as better service than your ISP’s DNS server. The IP addresses for DNS Advantage includes 156.154.70.1 and 156.154.71.1. Norton offers faster web browsing along with secure and safe Internet experience. It offers you 3 types of security policies that you can choose as per your need. The Norton DNS servers operate at IP addresses 198.153.192.50 and 198.153.194.50. Comodo secure offers secure, reliable and fast public DNS servers. It provides you with protection against harmful websites that can lead to malware and phishing attacks. The IP address for Comodo Secure DNS Servers is 8.26.56.26 and 8.20.247.20. These are the top 5 DNS servers that you can try other than your ISP’s DNS server. These public DNS servers will provide you with faster Internet connection and are very easy to configure on your router.